The Kingdom thought it was unfair that Cody and The Young Bucks — who don’t normally team together in six-man tag matches — were granted a shot at their ROH World Six-Man Tag Team Titles recently in Atlanta. They viewed it as ROH management showing preferential treatment to Bullet Club, which is a frequent accusation made by The Kingdom. The Kingdom ended up losing the titles when Vinny Marseglia was pinned after falling victim to Cody’s Cross Rhodes. In actuality, Matt Taven was the legal man, so the referee should not have counted the pin. Anti-conspiracy theorists contend that the match was so chaotic that it was understandable for the referee to have lost track of who the legal men were. During the four-way match for the ROH World Title between champion Dalton Castle, Jay Lethal, Cody and Matt Taven on June 30, Taven delivered a knee strike to Lethal’s head and then rolled up Castle. Taven had the champion down for well over a three count, but the referee was checking on the dazed Lethal rather than counting the pin. When the referee finally turned around to make the count, Castle kicked out just in time. Anti-conspiracy theorists contend that the referee did the right thing by checking on Lethal. They also say it was a case of poetic justice since Taven had a handful of Castle’s tights while pinning him. The Kingdom won a tournament in December 2016 to become the inaugural ROH World Six-Man Tag Team Champions, and they successfully defended the titles for more than three months. However, at the 15th Anniversary show in March 2017, TK O’Ryan suffered a broken leg during The Kingdom’s successful title defense against Dalton Castle and The Boys. At a television taping the next night, ROH officials made The Kingdom defend the titles against Bully Ray and The Briscoes, with Silas Young replacing O’Ryan. The team of Matt Taven, Vinny Marseglia and Young lost the titles. O’Ryan returned to action that August, but The Kingdom did not receive a rematch for the titles they never technically were defeated for until May 2018. Anti-conspiracy theorists contend that The Kingdom did indeed receive their title rematch in October 2017 against then-champions Bullet Club, but Taven rejects that argument because it was not announced as a title match until right before the start of the match. 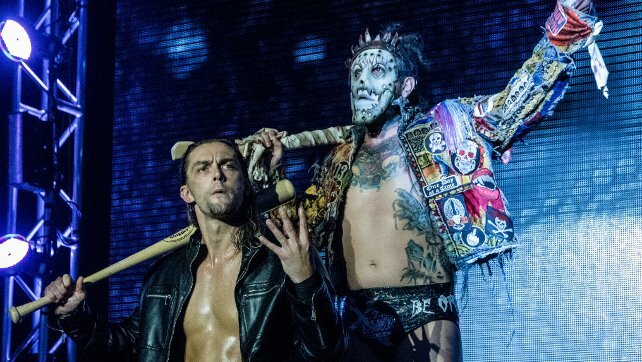 Plus, it was The Young Bucks and “Hangman” Adam Page who were the champions, but ROH ruled that any three members of Bullet Club could defend the titles, and on that night it was The Young Bucks and Kenny Omega. In the minds of The Kingdom members, it was just another example of ROH management bending over backwards for Bullet Club.